Interested in getting involved with the Marine Debris Monitoring and Assessment Project (MDMAP)? Start by viewing a series of six brief tutorials to guide you through everything you need to know about the MDMAP. Click the icon at the bottom right of each video to expand to full screen. 1. Overview: Tutorial 1 is an overview of the goals of the MDMAP, what is expected of MDMAP partners, and the benefits of getting involved. •	Marine Debris has become a pervasive form of pollution in our oceans. It is a unique environmental issue in that it is visible to the naked eye, making it easy for us to make connections between the debris we see in the environment and items we use in our everyday lives. The Marine Debris Monitoring and Assessment Project, or MDMAP, is a citizen science initiative to survey and record the amount and types of marine debris in the environment by engaging NOAA partners and volunteers across the nation. •	The MDMAP “Get Started Toolbox” is a resource for you (current and future volunteers) to learn more about the project, access documents and datasheets, test your knowledge of the survey protocols, search item photos, analyze your survey data, and find answers to frequently asked questions. •	This overview is the first of six brief tutorials to guide you through everything you need to know about the MDMAP before getting started. We will discuss the goals of the MDMAP, what is expected of MDMAP partners, and the benefits of getting involved in this effort. •	The NOAA Marine Debris Program created the Marine Debris Monitoring and Assessment Project in order to provide monitoring tools to partner organizations nationwide. The NOAA monitoring protocols were designed to be widely applicable and inexpensive to implement, and intended to promote standardization of shoreline marine debris monitoring efforts. With a larger, standardized dataset, we can begin to answer important research questions about the types, abundance, and sources of debris to the marine environment. Further, the MDMAP’s network of partner organizations and the results of locally-based shoreline monitoring studies provide great opportunities for outreach and raising awareness about marine debris issues, sharing the message that every individual can become a part of the solution. •	Regular, rigorous, long-term monitoring studies conducted through the MDMAP can provide meaningful data on the distribution, types, and abundance of debris in the marine environment. Knowing where, how much, and what types of debris are present, as well as how the debris load is changing over time, is essential to developing new and effective prevention policies and strategies for education and outreach. •	MDMAP volunteers are the backbone of this effort, and we would not have a successful project without them. The countless hours that our volunteers and partners have contributed over the lifetime of this project, and will in the future, is commendable and something we are incredibly grateful for. MDMAP partners have come from the non-profit, academic, and government sectors, and in some cases we’ve even had individual volunteers adopt a shoreline monitoring site. If you’re interested in volunteering with an existing partner organization to the program, please contact us through the “submit a question” link on the “Get Started Toolbox” and we can try to connect you with a local organization. If you’re ready to become an MDMAP volunteer, you should first review the information in the “Get Started Toolbox,” take the online protocol quiz, and request an account at the MDMAP online database to enroll in the program. By enrolling in the MDMAP, you are committing to conducting shoreline monitoring surveys on a monthly basis, according to the published survey techniques outlined in the toolbox. Be sure to check out the tutorials and protocol documents that explain how to conduct surveys and enter your data online. Partners need to upload their own data to the MDMAP Online Database in order for it to be included in any data analysis efforts. •	The NOAA Marine Debris Program (MDP) is supporting the marine debris community by leading efforts to compile debris data from volunteer-based surveys. Participation in the MDMAP puts data collected on debris from your local beaches into a larger national context. 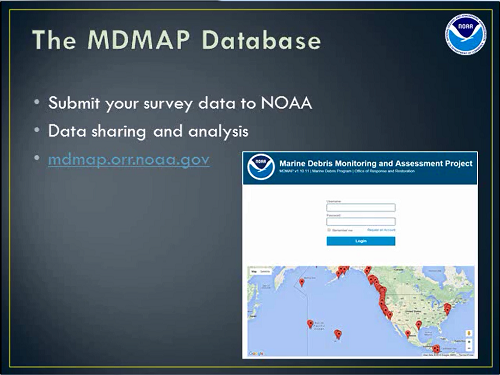 All data uploaded to the MDMAP Online Database is openly available to the research community for any data analysis efforts, including any projects sponsored by NOAA. The NOAA Marine Debris Program is committed to continuing to work with the marine debris community, applying MDMAP monitoring data to answer key research questions about debris in the environment. This will hopefully bring us to the ultimate goal of developing more effective prevention and mitigation strategies to prevent the impacts of marine debris on our oceans. Last but not least, MDMAP is a great excuse to get outside and get to know your local shorelines! 2. Safety Protocols: Tutorial 2 covers the importance of pre-survey safety checks, gear to bring with you in the field, and beach hazards to be aware of. 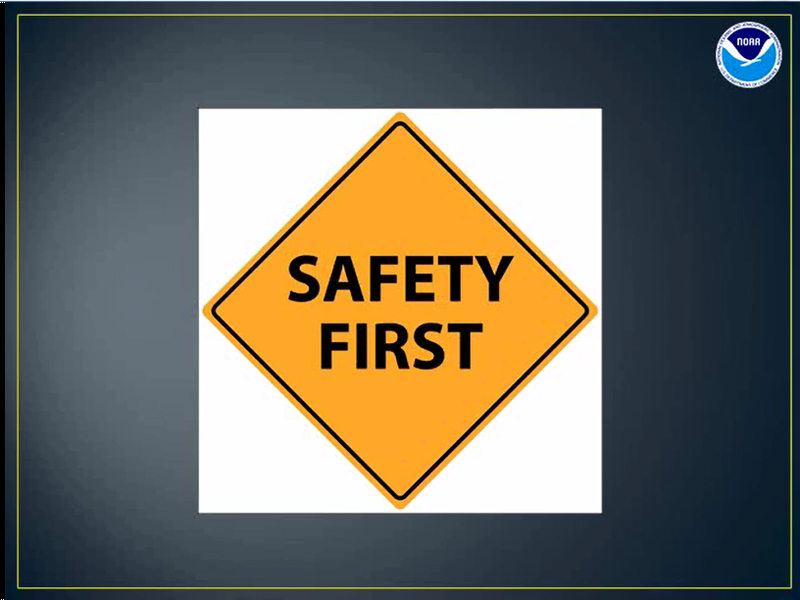 •	This Safety Protocols presentation is the second of six brief tutorials to guide you through everything you need to know about the MDMAP before getting started. •	The health and safety of survey personnel is the number one priority during any field activity. Always use caution before, during, and after field surveys to prevent injury to yourself, other beach goers, or the environment. •	Before leaving your home or office for any survey activity, make sure you’ve considered how you will get help if needed. First and foremost, use the buddy system. You should have at least one other person with you in the field at all times. Second, make sure you have a way to communicate with others, whether that’s a cell phone, radio, or emergency responder. And lastly, make sure someone you trust knows where you are going to be and when you expect to return. •	Check the weather and tidal conditions before scheduling your survey. NOAA weather forecasts can be found at www.weather.gov. Never conduct field operations in severe weather. Always bring proper gear and multiple layers of clothing for the range of possible weather conditions. In addition to being prepared for inclement weather, it’s important to recognize and understand the symptoms of heat stress. These can include headache, nausea, weakness, thirst, and heavy sweating or red, hot, dry skin. If you experience any of these symptoms, stop your survey immediately to rest and hydrate, and call 911 if your symptoms are severe. Ocean conditions can change rapidly. Check the tides at your survey site at tidesandcurrents.noaa.gov. The MDMAP protocols explain that surveys should be conducted at low tide. Going out at low tide is also a good safety precaution, especially in areas that may be flooded or inaccessible at high tide. •	Make sure you pack everything you might need in the field. Always wear and have sunscreen with you, even if it’s cloudy. In addition, bring a first aid kit, plenty of water, and a snack. Make sure that you are wearing appropriate clothing, especially close-toed shoes and gloves if you’re handling debris items. •	Stay alert and be aware of your surroundings and any potential hazards. If you come across any potentially hazardous materials, such as oil or chemical drums or propane tanks, alert local personnel or land managers, such as a park ranger. In some cases, you may need to dial 9-1-1 and the national response center at 1-800-424-8802. Do not attempt to move or pick up any item that looks like it may be dangerous or pose any kind of hazard. •	As mentioned before, the health and safety of survey personnel is the number one priority during any field activity. Review these safety tips on a regular basis and make sure any new survey personnel or volunteers are properly trained and prepared. 3. Survey Types and Site Selection: Tutorial 3 describes the two types of shoreline surveys and the things to consider when selecting a shoreline survey site. •	This “survey types and site selection” presentation is the third of six brief tutorials to guide you through everything you need to know about the MDMAP before getting started. In this presentation, we will discuss the two types of shoreline surveys and the things to consider when selecting a shoreline survey site. •	The first consideration when deciding how to select your shoreline monitoring site location is to determine which of the two MDMAP survey protocols you will be following. MDMAP survey sites are either standing stock OR accumulation survey sites, a determination which is usually made by the volunteer lead or program coordinator. Shoreline sites can’t be a mix of both types, and one protocol should be selected at the outset and used throughout the study. Let’s review the similarities and differences between standing stock and accumulation surveys. For a more thorough overview, make sure to go back and take a look at the Shoreline Survey Field Guide. First, both protocols require that you are out in the field for a survey every 28 days plus or minus three days, and both protocols are only used to record data on debris items longer than 2.5 cm in the longest dimension, about the size of a bottle cap. During standing-stock surveys, debris is not removed from the shoreline site and only 1/5th of the total survey area is covered, so surveys can be completed in a shorter amount of time. Standing stock surveys take a little longer to set up, but once you get going they are quicker than accumulation surveys. Accumulation surveys have a more straightforward protocol, but because the full area needs to be surveyed and all debris larger than 2.5 cm is picked up and removed from the shoreline, they tend to take up more time. •	During accumulation surveys, all debris items larger than 2.5 cm in the longest dimension are tallied on data sheets, removed, and disposed of. The surveys can take a significant amount of time depending on the width of the shoreline, as the entire length of the site must be surveyed. The crosshatched area shown here represents the area that must be surveyed. Accumulation surveys require initial clearing of all items larger than 2.5 cm from the site, followed by monthly surveys and removal. This provides an estimate of the net flux of debris onto the shoreline or debris deposition rate, in units of number of items per square meter per day. Note that debris deposition rates will vary over the course of time between surveys, and the calculated flux is only an estimate. •	During standing stock surveys, only one-fifth, or 20%, of the shoreline site is surveyed. The surveyed area is within four randomly-selected transects, such as shown the crosshatched area in the example here. Debris items found within the transects are tallied on datasheets, but are left on the shoreline. As with accumulation surveys, only items larger than 2.5 cm in the longest dimension are recorded. Standing stock surveys are quicker than accumulation surveys, as less area is covered and debris items don’t need to be removed. For standing-stock surveys, each survey event is a snapshot of the concentration of debris at the site, in terms of # of items per square meter. A series of these snapshots over time provides information on changes in the baseline or reference concentration of debris at that location. In standing stock surveys, the measured debris concentration reflects the long-term balance between inputs and removal of debris from the site, which helps us evaluate the long-term, cumulative impacts of debris. Debris cannot be removed from the shoreline site during standing stock surveys to maintain the integrity of the study objectives. This can be hard for some to accept, but leaving the debris on the shoreline allows for analysis of changes in debris concentrations over time, which is important information for the research community. •	The major driver in determining what type of survey you select and your site selection are your study objectives. Accumulation surveys tell you how much debris is being deposited on a beach over a given time period. If your objective is to determine how the composition or amount of debris deposited on a beach changes over time, you would use an accumulation survey to assess debris flux. Standing-stock surveys tell you how much and what types of debris are present on the shoreline, and how the debris load changes over time. If your objective is to determine what time of year debris loads are highest, or how debris loads are changing over the course of many years, you would use the standing-stock survey protocol to assess debris concentrations. •	As mentioned, your site selection will primarily depend on your study objectives. For example, if your study is focused on offshore sources of marine debris, you don’t want to choose a site near a river mouth or stormwater outfall. It’s also important to consider any impact your surveys may have on the local environment. Do not conduct surveys in nesting areas or critical habitat for endangered or protected species. Local land managers and agencies can help you determine an appropriate location for your survey site, and should always be contacted during the site selection process. In many cases, permits or other special permissions may be required. Review the protocol documents in the Get Started Toolbox for a complete list of ideal shoreline site characteristics. Sites should have a sandy or pebble shoreline, allow for direct, year-round access, not contain breakwaters or jetties, and have limited or no regular cleanup activities. Sites should also be at least 100m parallel to the water’s edge, as shown in the figure here. Online mapping tools can be helpful for identifying access points, human interest points, piers, and breakwaters, but local knowledge is the most useful tool in identifying a good survey site. Depending on your location and objectives, you may want to consider selecting more than one 100-m site along a given stretch of shoreline. Once you’ve selected a survey type and shoreline site location, you’re ready to complete the shoreline characterization and begin your surveys! 4. Conducting a Survey (standing stock): Tutorial 4 discusses how to prepare for and conduct a standing-stock survey. 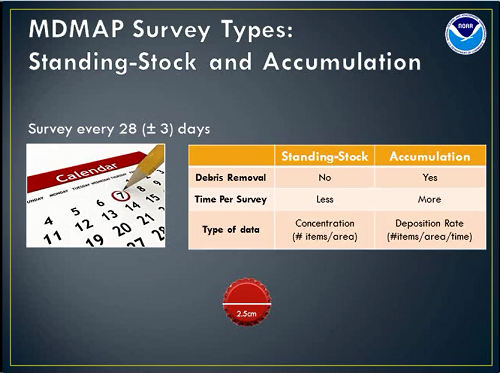 •	This standing stock survey overview is the fourth in a series of six brief tutorials to guide you through everything you need to know about the MDMAP before getting started. In this presentation, we will discuss how to prepare for and conduct a standing stock survey. •	Before any sampling begins, visit each site to complete the shoreline characterization datasheet. This datasheet should be updated once per year to record any changes at your site. We’ll start with the first page of the site characterization datasheet. The first step is to create a shoreline name, which will remain the same throughout your study and will be used to identify your site in the MDMAP database. The MDMAP site name should include any local park or beach names, for example “Ocean City Mile 20” or “Main Beach South”. An essential step is to record the GPS coordinates of the beginning and end locations of your shoreline site. You can use a handheld GPS unit, a smart phone, or as a last resort, an online mapping tool to get your coordinates. The MDMAP only accepts GPS coordinates recorded in units of decimal degrees. Refer to the FAQs section of the Get Started Toolbox if you have questions about GPS units. If your shoreline width from the water’s edge to the back barrier is greater than 6 meters, GPS coordinates must be recorded at all four corners of the site, denoted by the red dots in the figure shown here. If your beach is less than 6 meters wide, you only need to record two coordinates, at the midpoint of the beginning and end locations of the shoreline site, denoted by the yellow dots in the figure shown here. Take photos of the shoreline while completing your site characterization, and upload them to the MDMAP database. This is explained in more detail in the Data Entry tutorial. 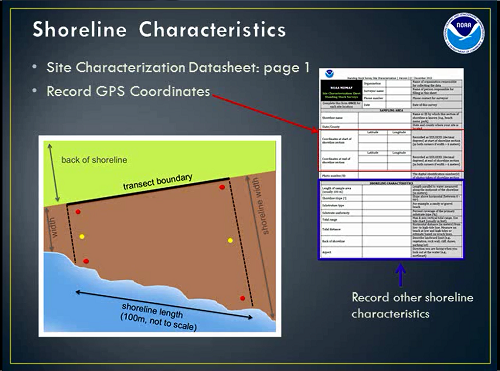 The bottom half of the first page of the site characterization datasheet asks for other shoreline characteristics. This includes the shoreline length, which is usually 100 m, slope, substrate, and tides. Refer to the Get Started Toolbox FAQs if you have questions about how to determine the shoreline characteristics. •	The second page of the site characterization datasheet asks about the surrounding area and land use. Nearby river or drain outfalls, the distance to the nearest town, and other land use characteristics can all affect the types and abundances of debris at your shoreline site. Online mapping tools may come in handy for finding some of this information. There is space at the bottom of the page to record notes on landmarks, local current patterns, or to draw a map depicting site access or a shoreline profile. •	In addition to following all of the pre-survey safety checks explained in the safety tutorial, make sure you have all required equipment, including a measuring tape or wheel, survey flags, clipboards and pencils, a ruler, a GPS unit, camera, first aid kit, water and a snack, and four copies of the three-page standing-stock survey debris datasheet. Review the survey debris datasheet before leaving home. Use the random number table from the protocol document or quick reference field guide to select the four transects you’ll be surveying during your visit. You can pre-label the transect number box at the upper right corner of the datasheets. •	Download and print the Standing Stock Survey Quick Reference Field Guide from the Get Started Toolbox Protocol Documents and Field Datasheets section. It is a great resource to refer to while preparing for your surveys. •	When you arrive at your shoreline site, use the GPS units from your site characterization to navigate to your site starting point, and use flags and the surveyor’s measuring wheel to mark the boundaries of the 100-m site. Then use the measuring wheel, flags, and transect location table from the standing-stock quick reference guide to mark off your four randomly chosen 5-m transects. Use as many flags as needed, usually at least 3 on each side, to identify the transect boundaries between the water’s edge and the back of the beach. At your first transect, complete the ancillary information on the first page of your datasheet. This includes recording GPS coordinates at the back of the beach and the water’s edge, or only one coordinate in the middle of the transect if the shoreline is less than 6 meters wide. Now you are ready to search the transect for debris items. Remember that debris larger than 2.5 cm is tallied, but not removed from the shoreline during standing stock surveys. Use a walking pattern that works best for you, for example, starting at the water’s edge and walking along parallel lines toward the back of the beach. Walking pattern diagrams are provided in the shoreline survey field guide. All items within the transect are recorded on the datasheet labeled with the corresponding transect number. After you’ve finished your first survey, record the time at the end of the survey and any notes about evidence of cleanups, any sampling issues, or information about photographs you’ve taken. Repeat these steps for the remaining three transects, using a new data sheet for each transect. •	It’s really important to remember that MDMAP shoreline surveys are only for items larger than 2.5 cm in the longest dimension. The 2.5 cm size cutoff is about the size of a bottle cap. This is used as a standard metric across the MDMAP because it can be reliably detected with the human eye. For consistency and data standardization, all MDMAP survey teams must follow this rule. All debris items larger than 1 foot are tallied separately in the large debris items section on the third page of the survey datasheet. •	It’s not uncommon to find items that you aren’t sure how to record. Make sure to record descriptions of items tallied under the “other” field of the datasheet. Do this while you’re still in the field so it is as accurate as possible. You might find over time that certain items continue to appear, and careful notes will help you to know which items are more common than others. Photos are also really helpful. If you can’t identify an item, or don’t know where it should be recorded, take a photo, record a description, and search the photo ID gallery in the Get Started Toolbox when you return home. Because items aren’t removed during standing-stock surveys, you might see the same exact item on the shoreline over time. Always record all items larger than 2.5 cm when completing a standing stock survey, even if you have encountered the same item in a previous survey. This is what makes standing stock surveys so informative! 5. Conducting a Survey (accumulation): Tutorial 5 discusses how to prepare for and conduct an accumulation survey. •	This accumulation survey overview is the fifth of six brief tutorials to guide you through everything you need to know about the MDMAP before getting started. In this presentation, we will discuss how to prepare for and conduct an accumulation survey. •	In addition to following all of the pre-survey safety checks explained in the safety tutorial, make sure you have all required equipment. This includes a measuring tape or wheel, survey flags, a bucket or bag, clipboards and pencils, a ruler, a GPS unit, camera, first aid kit, water and a snack, and a printed copy of the accumulation survey debris datasheet. Review the survey debris datasheet before leaving home. •	Download and print Accumulation Survey Quick Reference Field Guide from the Get Started Toolbox Protocol Documents and Field Datasheets section. It is a great resource to refer to while preparing for your surveys. •	Use the GPS units from your site characterization to navigate to your site starting point, and use flags and the surveyor’s measuring wheel to mark the boundaries of the 100-m site. Use as many flags as needed, usually at least three on each side, to identify the site boundary between the water’s edge and the back of the beach. Complete the ancillary information on the first page of your datasheet. Just like you did for the site characterization, record GPS coordinates at the start and end of the shoreline site. This will be at both the back of the beach and at the water’s edge, or only one coordinate in the middle of the site if the shoreline is less than 6 meters wide. It may seem repetitive, but it’s important to have a record that you return to the exact same shoreline site at each visit. Now you are ready to search the site for debris items. Remember that debris is tallied and removed from the shoreline during accumulation surveys. Use a walking pattern that works best for you, for example starting at the water’s edge and walking along parallel lines toward the back of the beach. Walking pattern diagrams are provided in the shoreline survey field guide. It’s best to tally items on the datasheet as you go, rather than collect items and tally them at the end of the survey. Debris items can be brittle and break apart into multiple pieces while transported in a bag or bucket. After you’ve covered the entire area, record the time at the end of the survey and any notes about evidence of cleanups, any sampling issues, or information about photographs you’ve taken. •	It’s not uncommon to find items that you aren’t sure how to record. Make sure to record descriptions of items tallied under the “other” field of the datasheet. Do this while you’re still in the field so it is as accurate as possible. You might find over time that certain items continue to appear, and careful notes will help you to know which items are more common than others. Photos are also really helpful. If you can’t identify an item, or don’t know where it should be recorded, take a photo, record a description, and search the photo ID gallery in the Get Started Toolbox when you return home. 6. Data Entry: Tutorial 6 explains how to enter survey data and download monitoring reports from the MDMAP database. •	This data entry presentation is the last of six brief tutorials to guide you through everything you need to know about the MDMAP before getting started. In this presentation, we will discuss how to enter survey data and download monitoring reports from the MDMAP database. 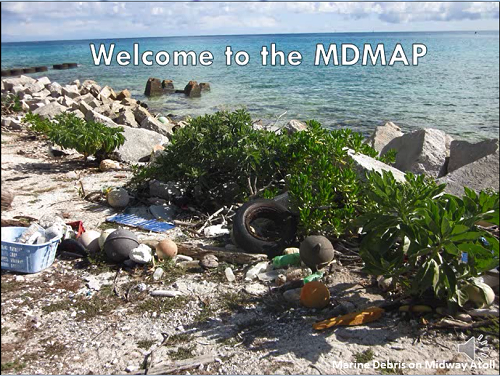 •	The MDMAP database is the online repository for MDMAP shoreline marine debris survey data, and is the only way to submit your survey data to NOAA. The database was created as a tool to assemble data from various local marine debris monitoring efforts, so we can compile a bigger picture of the issue at regional and national scales. The database facilitates data sharing and analysis by making survey data available to researchers, students, and other interested parties. The database is housed at mdmap.orr.noaa.gov, and features a map of MDMAP shoreline sites on the homepage. •	To access the database, navigate to mdmap.orr.noaa.gov, and select “request an account”. You’ll receive an email letting you know when your account is active. •	This presentation is just a quick overview of the different features in the database. Step-by-step instructions can be found in the Database User Guide. You can access the user guide from the MDMAP Get Started Toolbox or the resources tab of the database. •	The database has site characterization and survey entry pages that mirror the paper datasheets used in the field. To create a shoreline site in the database, look for the blue “Add a New Site” button, fill out your site characterization information, and upload any photos of your site. •	Once your site is created, you can submit survey data and photos after each survey. From the site characterization page, look for the blue “Submit New Survey” button to navigate to the survey submission page. Then, simply translate the information from your paper datasheets to the online form. For standing-stock surveys, each transect is submitted as a separate survey. Shoreline sites and surveys created under your account login can only be edited by you, but other users can download your survey data. The database has a Custom Data tab, which is where users can add unique debris types to their datasheets within the framework of the debris types on the standard datasheet. This feature will allow users to track data on debris items that may be locally relevant but are less common on a national scale. Refer to the Database User Guide for more information on how to create and work with custom data. •	The homepage of the database also features an “other sites” section where you can explore other survey teams’ sites, surveys, and photos. All data and photos go through a verification process before being made public. Keep in mind that other users can explore your data as well. •	You can download survey data to an excel file from the reporting tab. There are a few different types of reports to choose from, depending on whether you’re looking for accumulation or standing-stock survey data. Reports are filtered based on location and time, so you can choose which sites and surveys you’re interested in. More information on reports, debris concentration, and flux calculations can be found in the database user guide. •	Thanks for listening to the MDMAP Get Started Toolbox tutorial series! Explore the other sections of the toolbox to find protocol documents and field datasheets, frequently asked questions, the protocol quiz, data analysis templates, and the monitoring photo gallery. The MDMAP is possible because of the hard work of our passionate and devoted partners and volunteers. Thank you for participating!